Westfield is one of the largest mall operators in the world. As brick and mortar retailers suffer with e-commerce’s rise it’s increasingly important for malls to innovate. Westfield Labs was formed to handle this digital evolution by solving challenges and shaping opportunities for global retailers looking to stay on the cutting edge. Yeti worked with the Westfield Labs executive management team on several initiatives before they eventually were able to spin it out into its own standalone company, One Market. 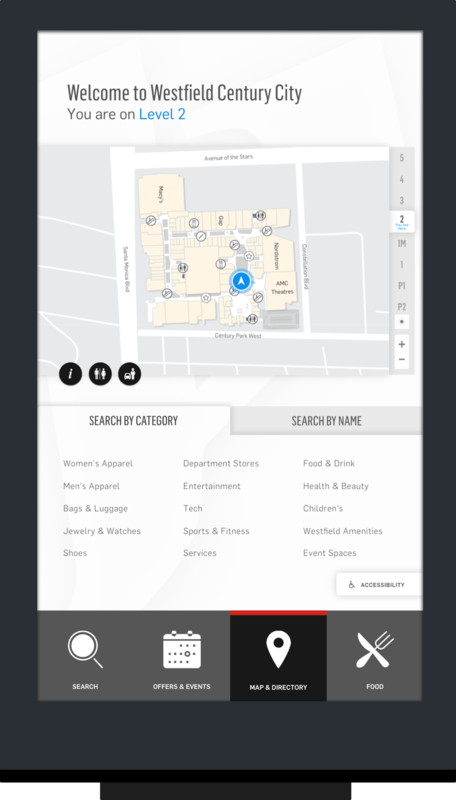 One of the challenges we took on was to reinvent the static old mall directory, better engage mall visitors and guide them to their destination quickly and easily. Yeti took over the interactive kiosk project which had been underway for several months and had a deadline looming for a mall grand opening months away that looked near impossible to make. If we could make it past this first deadline there were also more malls, with their own layouts, feature requests, and needs on the roadmap soon after. The version of the kiosk we needed to build on an aggressive timeline for this first launch also had to accommodate these future rollouts and customizations. How do we create an interactive kiosk platform that can effectively scale to many centers and still be customizable for each’s specification and nuances while hitting high profile immediate deadlines? Yeti partnered with Westfield’s product management team to co-create a product roadmap and architectural plan to hit immediate deadlines in the short term and then iterate to a scalable kiosk management platform. As Yeti’s team first assessed the existing kiosk project, it was clear that a majority of it needed to be re-written as it was using an outdated and deprecated frontend framework. This was an important decision to be made as it would allow us to iterate faster and hit the first major launch deadline instead of trying to band-aid the existing software solution that was already in place. Rebuilding the kiosk to use React also afforded us the ability to use the framework’s component structure to create re-usable pieces depending on what was configured for each mall. This meshed well with the concept of layout orientations and feature flags which were developed later in the product roadmap. 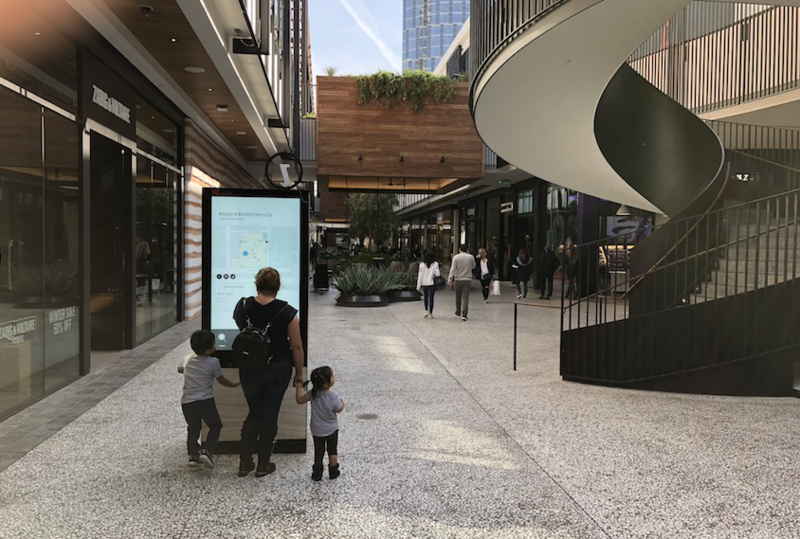 After delivering on the first couple of kiosk launches our attention turned to scaling the kiosks into a platform that would allow for kiosks to be implemented much quicker without custom development needed at each malls. This involved taking the current simple administrative portal and considering everything that may need to be configured for each installation. Yeti worked with Westfield’s product management team to create a robust feature set of user stories that would cover all likely launch and configuration scenarios. 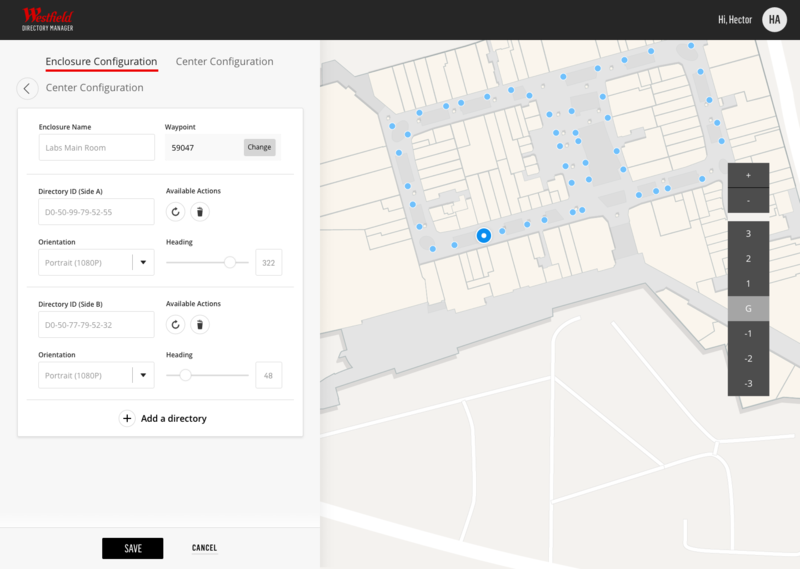 An added complexity to this was also the integration with mapping and wayfinding software platform Jibestream. With Jibestream we were managing the locations and directions to specific floors, elevators, amenities, among many other points of interest. Yeti’s team collaborated with Westfield’s for over a year in order to expand the platform from the first Westfield mall to several others. The transition from one center, to multiple configurable centers incurred quite a bit of technical debt that came from changing requirements, new design changes, and the usual software updates. A key piece of Yeti’s development strategy was to consistently scope in and execute on technical debt tasks and keep the codebase covered by automated tests. With many high profile and visible kiosks at malls, it has been important to ensure updates and improvements for new centers do not affect any existing ones. Westfield’s digital directories have now successfully launched in four major centers with multiple more scheduled for implementation. Most notably they can be found in some of Westfield’s largest flag ship malls in London, Century City in LA, and in the World Trade Center in New York City. 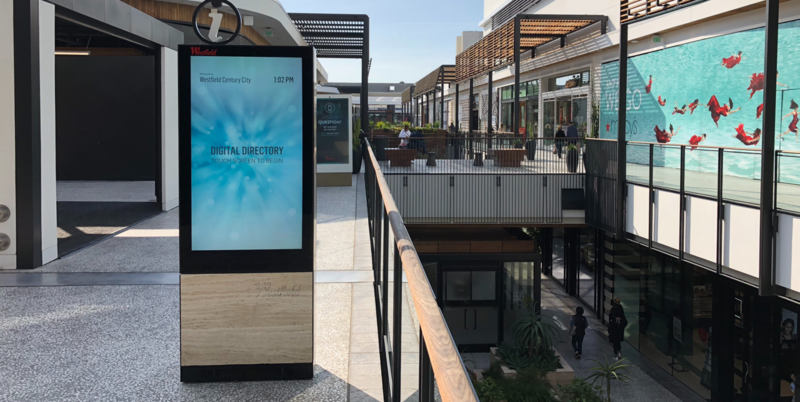 With kiosk configuration now being customizable, Westfield has been able to deploy over a hundred kiosks with thousands of mall customers interacting with them each day.